time Anytime of the day, any day of the week. Dare to be different! 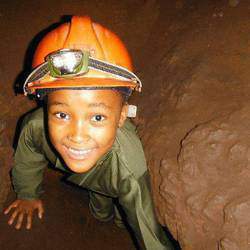 Adventure Caving in the Cradle of Humankind World Heritage area, 40 minutes from Jhb/Pta.Dangle like a spider on the end of rope as you enter through the roof of a wild cavern. After the 18-metre abseil, explore by torchlight on a guided tour and end up 70 metres below the earth's surface. Think dripping water, dust and dark! NO previous caving or abseiling experience is necessary on any of these adventures- the capable guides take care of it all. School groups, where the focus is on the ecology of the cave, can get special scholar rates. "Above the ground" funstuff includes rockface abseiling (and courses on how-to-do-it) and awesome hiking in the Magaliesburg as great alternatives. Kids' parties, with a minimum of 10 adventurers charged at @ R250pp. The price includes all safety equipment supplied for the 3+ hour adventure and adults come in at this reduced price as well. Most Sundays, there are no-minimum numbers excursions. 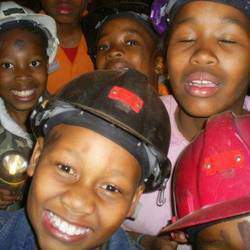 R250-00 per child (all equipment supplied) and R400-00 per adult. Have to tell you that this was the best decision for a birthday ever. They all had loads of fun and cannot wait for the next time.Thanks to Wild Cave Adventures for a most memorable outing! We took my 13 year old daughter and some friends on this cave adventure.The kids had an absolute blast. They cant wait to go again! I just want to thank you for an AMAZING outing that we had with our Grade 3's! The guides were excellent and responded so well to the children. Their patience and support was great. It was an absolute adventure for our family, with kids of all ages. The kids loved it, they keep asking when we are going back. Dawie and Scott were fantastic and both deserve a huge praise for their guidance and knowledge. We had so much fun. I think the kids are still washing dust from places lol. We will definitely be booking another trip soon. Everything worked like clockwork and these 9 year old kids absolutely loved it. They were raving about the party at school yesterday and said it was the most awesome party ever. My son absolutely loved it and I think the best part was that they did not know what to expect. All the parents sent me messages saying that their boys couldn't stop talking about the party! Thanks to Sandy and the guides for all the assistance, and to Megan who took all the awesome photos. My husband will download all the pics for us to keep in our party albums and I will send the link to all the parents. I cannot thank you enough for the wonderful event you hosted for my son’s 13th party. The kids thoroughly enjoyed it and can’t stop talking about it. The guides were amazing with them. In all my years in arranging corporate events and children’s parties, I have never come across such a competent team with such service delivery. Thank you very much! Baie dankie .... almal het dit verskriklik geniet! A huge thanks for another great caving experience in Bat Cave! After 2 brilliant birthday parties for my children, I decided to share the experience with our Cub Scout Group and it was a total success! The Cubs had a great time from being lowered into the “scary dark hole", to crawling and squeezing through crevices, all the while learning about rocks and minerals from your knowledgeable guides. It is so different from other local caves - the children really feel like they are having a big adventure exploring under the ground as well as having fun. I’m sure we will be back! My 11-year-old (and guests) had an absolute blast and Dawie was great with them. It was a great pre-team building for the gang before they headed out to school camp this week! Friday 1 September was awesome - the young eight year old adventurers (and adults) had an incredible time! Wow! Best party decision ever! The service and quick calls and directions were outstanding. Dawie and team were just absolutely brilliant and professional!